It’s been a while since Gideon Obarzanek created anything even close to a pure dance work. Not that Connected is pure dance. 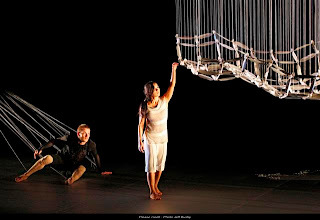 Featuring a kinetic sculpture by Reuben Margolin and snippets of spoken word, it’s a hybrid creation which heralds a new maturity in Obarzanek’s choreographic output. The whole piece is in tune with the quiet grace of Margolin’s contribution. A delicate white grid, suspended by strings and attached to a wooden wheel, the sculpture is both set and subject, at times almost another performing body. Whether directly controlled by the performers, or in the mathematically precise and mesmerizingly beautiful waves created by a small motor, it’s amazing. A mellifluous duet for Alisdair Macindoe and Stephanie Lake is one of the best Obarzanek has produced. It’s a variation on the manipulation technique he has favoured for years, now developed into a sophisticated and seamless exchange of undulating bodies, which echoes the sculpture’s oscillations. The kaleidoscopic patterns shaped by the five dancers in the final scene, particularly when in full silhouette, are an embodiment of elegant geometry, constantly unfolding through symmetrical forms. This abstraction is balanced by a humanistic section inspired by gallery security workers. Anna Cordingley’s flatteringly functional monochrome costumes and Benjamin Cisterne’s restrained but effective lighting states continue the simple, clean aesthetic, while the exquisite soundtrack by Oren Ambarchi and Robin Fox winds through cyclical progressions using electro-acoustic instrumentation. The scope of this multi-faceted work is wide, but Obarzanek draws all the elements together with finesse. A version of this review was first published in The Age newspaper. The idea of having some kinetic sculpture on a contemporary dance is such a brilliant one! It added an extraordinary dance scene. Amazing job!